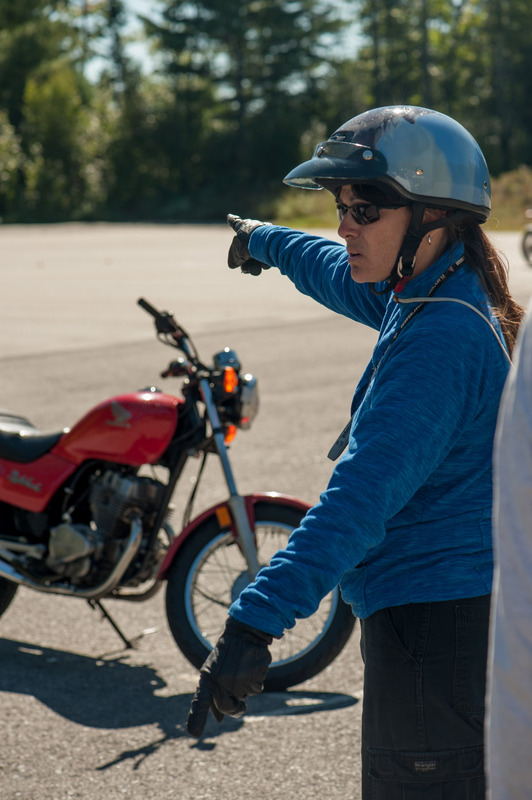 At A & J Motorcycle Safety School we have been offering Women’s only classes for 9 years. We recognized a need early on after several women said they would feel even more comfortable learning with other women. During our first year of operation we started offering women’s only classes and they quickly sell out. As with all MSF Basic Rider Courses there is a minimum & maximum amount of students. For the Women’s only we limit the maximum to 10 providing a ratio of 5 students to 1 instructor. Many students in the Women’s Only Course have never ridden before the class or have been a passenger who’s ready to move up to the front. We understand that anxiety may be high and confidence a bit low starting out. By the end of the weekend the goal is to flip that to higher confidence and lower anxiety. We offer the women’s only class on the last weekend of April, June and August. The course runs 2 days and typically starts at 9am and goes to 6pm both Saturday & Sunday. During the busiest time of the training season (April, May & June) there may be an additional class being held on the same weekend, however the classes are totally separate and your comfort and privacy is ensured. While this course is designed for someone who has never ridden a motorcycle before it can be helpful if you can already drive a standard car or truck or can ride a bicycle. If you feel you might need a little extra training with clutch control before the class please make an appointment with us for some pre course familiarization with the motorcycle’s clutch and controls. We also have a simulator where you can practice using the clutch in real time without moving an inch. You’re also welcome to stop by while a class is underway. Please call first to ensure there is a class going on and let us know so we can have someone available to show you around and explain what you will see at the range. A & J offers private group classes (minimum of 4, max of 12) for any Basic Riders Course that we provide, whether that’s the BRC or the BRC2 for the experienced rider. We can hold the class during the week or with enough notice a weekend. This is a great opportunity for a team building adventure, a fun family activity or a great way to spend a couple of days with your friends mastering a new skill. At A & J we understand that you may feel most comfortable in a private setting surrounded by colleagues, friends or family. so this may be a perfect option for you. Also if you have unlicensed riders or permit holders in your motorcycle group who would benefit from a private class we would be happy to accommodate your group. Please call a few weeks in advance to set up a time that works for you and your friends. This class will focus on the basics of pre ride routines, how to check fluids, basic roadside maintenance and pre-season or post season bike prep. Classes will be offered several times during the summer, watch for times and opportunities to sign up.